Chapter One Books is a lovely place to eat, drink, study, relax and, as I recently found out, enjoy open mic performances. It was here I saw Too Shy: Open Mic, and for £3 the event was a steal. There was a diverse range of performers, from second years to postgraduates, from “Moss Side to Miami” (though, it turned out, there was no one from Miami). It was heart-warming to see such a collection of people gathering to enjoy poetry on a Saturday night. The event, hosted by the University of Manchester’s Creative Writing Society, was titled ‘Too Shy: Open Mic’ and for good reason. Kayleigh Jayshree-Hicks, who introduced all the performers, gave advice regarding anxiety being on stage. Importantly, she discussed where this anxiety stems from and how to learn to deal with it as performer. Patience Kanjira stood out to me with her performance. Her first poem was about warming up to the idea of love, explored through images of ice, igloos and glaciers, ending with a dangerously exciting ‘scorching love’. She beautifully captured the hesitance and vulnerability in her performance. Her next poem was drastically different in style, tone and performance. Beginning with the direct question, “Why are you touching my hair?” the poem explored the fetishisation and appropriation regarding black women. The poem was full of puns and metaphors, my favourite of which was “this split-end conversation”. All this technical excellence led back to the simple question, stated at the beginning of the performance, demonstrating control and craft on Kanjira’s behalf. Each performer brought lots of energy to their performances. Jack Greeney’s sardonic humour ran through Horror-scopes, his play on horoscopes. Nina Jakulin Vavpotič’s performance was brilliantly ironic, writing to guidelines for a poetry competition. Kofi Gyamfi’s performance centred around identity with lines such as “When the M16 in me speaks”. He performed with a deft touch, speaking on both a personal and universal level. The chair of the Creative Writing Society, Toreh O’Garro, ended the set. One of his poems, ‘Moss Sidian Oddities’, was filled with wonderful lines like “Don’t forget the raining Sakura trees that kiss the hands of Princess Road”. Cheered on by the crowd, he brought the wonderful night to a close. 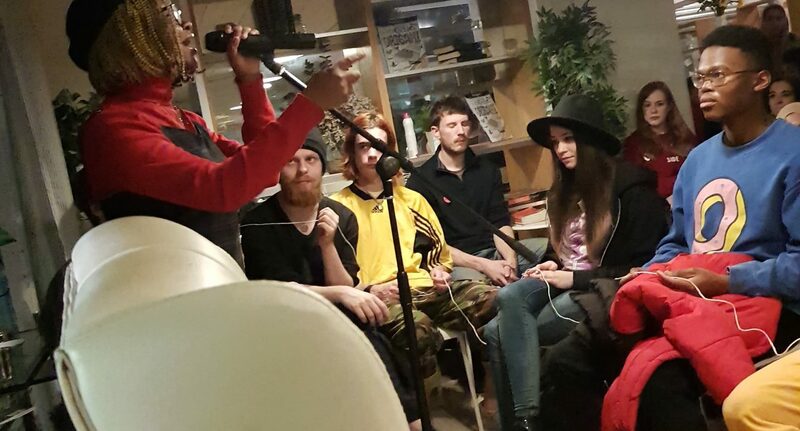 The Creative Writing Society hosts these open mic nights regularly, at different locations, with this particular Too Shy event a particular hit with those performing for the first time. They are also preparing for Uni-Slam, a nation-wide slam poetry event where universities send a team of poets to compete, as well as a chance to work with professional poets and performers. This event establishes the Creative Writing Society as an active society with engaged committee members who care about people and their stories.